Janga and I shared a love for all things Anne Gracie. We admired her kindness, her intelligence, her wonderful sense of humor, and her ability to tell a story that never failed to immerse us in the lives of her characters and the time and place in which they lived. This review and Q&A are from April 9, 2018. Lily Rutherford sees herself as fat, stupid, and unattractive, but she dreams of finding someone she can love who will love her as she is. Her Aunt Augusta, a harridan with social influence, is determined to see Lily, her sister Rose, and Georgiana, their niece and contemporary, married advantageously. She hopes that the fortune Lily will inherit will offset the eighteen-year-old’s deplorably lush curves and the shameful handicap of her illiteracy. To everyone’s surprise, gentle Lily refuses to cancel her plans to meet a former schoolmate at a ball in order to accommodate Aunt Augusta’s scheme to introduce her nieces to a duke and his friend during an opera visit. Lily’s rare show of independence is almost her undoing. Her foolish friend introduces Lily to a scoundrel who dupes the heiress, drugs her, and abducts her, planning to force her into a Gretna Green marriage. Lily is frightened, but she proves her intelligence and resourcefulness by escaping from her abductor and his henchman. Just as they are about to recapture her, Edward Galbraith, her brother Cal’s rakish friend and best man at his wedding, rescues her. Edward, in true hero fashion, eliminates the villains with ease, but he is left with the problem of returning Lily to her home without anyone knowing that she has traveled in his company without a chaperone. Edward almost succeeds in maintaining the secret, but just as victory is in sight, he and Lily are spotted by Aunt Augusta’s most formidable social rival who can’t wait to spread scurrilous gossip. Edward has no desire to be married, but, despite his reputation, he is a man of honor who cannot see an innocent ruined. He genuinely likes and respects Lily, and he is uncomfortably aware of the attractions of her curvy body. However, he believes that love is not for him. He makes certain Lily understands exactly what he is offering when he proposes that they marry. Lily, of course, has fallen hard for Edward. Ignoring her family’s doubts and with the example of her besotted brother and his convenient bride in mind, she agrees to marry Edward. Will she see her marriage of convenience transform into a love match? Lily just may prove competent even for this daunting task. Anne Gracie has written another winner! Despite a kidnapping plot that comes distressingly close to melodrama with a villain who is little more than a handy device, the second marriage-of-convenience tale is a charming story of two likable characters who deserve their HEA. Edward is an appealing hero, a veteran of the Napoleonic Wars whose scars are deeper than anyone suspects. However, Lily is the heart of this book. She begins as a shy girl with a crippling lack of self-esteem, but as life tests her, she grows into a woman of strength and self-knowledge who has the courage and the wisdom she needs to fight for what she wants most. Lily totally won my heart. She is one of my favorite Gracie heroines, right up there with Kate Farleigh (Gallant Waif),Lady Helen “Nell” Freymore (His Captive Lady), and Daisy Chance (The Summer Bride). A superlative cast of secondary characters offer additional reasons to love this book. 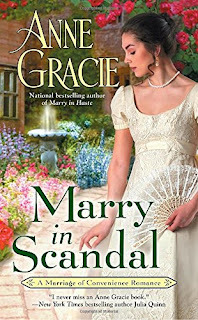 Gracie fans will be happy to see more of Cal and Emmaline (Marry in Haste) and to see the connection to characters from the Chance Sisters series expanded. Rose and George become increasingly interesting, leaving readers eager for their stories. Gracie has a history of creating well-drawn, memorable older women characters, and in this book, she adds an older man to her repertoire. Edward’s grandfather is a dear, a kind, caring man who loves his grandson enough to respect his autonomy. If you enjoy historical romance with characters who will steal your heart and a story that will leave you laughing at times and wiping away tears at times, if your favorite stories are those in which the hero and heroine rescue each other, I highly recommend this book. Janga: Lily won my heart from the prologue on. She may be my favorite Anne Gracie heroine ever. I can recall several historical romances in which the hero has a learning disability, usually dyslexia, but it is much rarer to see a heroine with such a problem. Was Lily inspired by your experience teaching adults to read? Anne: I'm delighted you love her, Janga - - and yes, she was partly inspired by my teaching experiences. The bravery with which she faced her difficulties was inspired by so many of my adult literacy students. It takes courage to seek out a reading class as an adult with a long history of failure behind you. These days most people understand a reading disability has nothing to do with being stupid, but that was certainly not the case back in the Regency. Janga: I loved seeing the characters from the Chance Sisters books again. It all seemed so organic - - both the dressmaking and the literacy society. Can we look forward to seeing Rose and George visit the House of Chance in their stories? Anne: I'm not sure. I never plan these things, but I hope so. If the opportunity arises, I'll take it, but it has to feel, as you say, organic, rather than contrived. PJ: Some of my favorite scenes included Lily recapturing her enjoyment of food with Edward's encouragement. What food(s) have you grinning with pleasure? Anne: All kinds of food, PJ, though I'm more of a savory lover than a sweet-tooth - - pizza before pavlova, please. And pleasure in food also depends on the situation and the company. The wrong dinner companion can ruin an otherwise delicious meal. Conversely, a simple meal eaten with a loved one can be a feast. I'm glad you enjoyed those scenes, PJ. I like historical dishes to use in my books - - I have several recipe books from the 18th and 19th centuries - - and in this book I enjoyed having Lily discover some traditional Yorkshire specialties, as well. Janga: One of my favorite characters in Marry in Scandal was Edward's grandfather. You often have older characters in your books who are genuine personalities and not just handy plot devices. Do you create such characters consciously, or are they gifts from your muse? Anne: Gifts from the muse, definitely, Janga. And it's not just older characters - - though I do enjoy them. I like how older characters can be more outspoken and often a bit outrageous and "out there," and that's fun. But it's a blessing when a character just springs to life on the page. The moment Edward's grandfather and Lily met before the wedding they clicked, he was alive in my head, and I knew he was going to become important later. Which he was. Janga: I know we have two more books to anticipate in this series. Will it end with the quartet, or do you have more books planned in this series? Anne: At the moment it's just the quartet. I always find more characters to write about, but series length is a decision made by my publisher. That said, I've written a 4 book trilogy, and a 5 book quartet (that many people think should have been extended to 6 books - - (yes, Marcus). And though I managed to stick to four books for the seasonal bride quartet, a story for Ash, one of the partners in Flynn & Co. keeps nagging at me. But it would be a novella, and self-published if I wrote it. Anne: Oh, Janga (and PJ), so many people ask me about Marcus. Even though that series finished several years ago, I still get emails asking for his story, and I love that people remember him and want his HEA - - thank you! I do want to write it - - I'd actually started on it, but it wasn't contracted and my then-editor had read my proposal for the new series (Autumn Bride, etc.) and wanted me to start on that instead of Marcus. When I do write his story, I'll self-publish it, but I'm no good at working on two stories at once, and Marcus's story (as it exists in my head) is a full length novel, not a novella, and I'm not a speedy writer, so while I have contracted books to write, that's what I have to do. But one day Marcus's book will come. 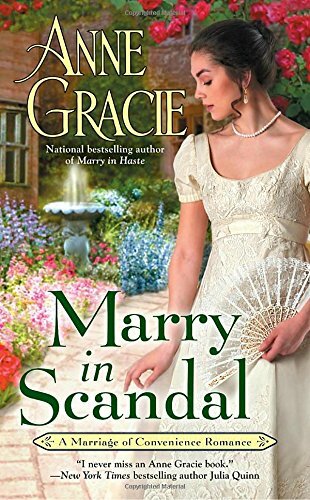 PJ: Janga and I have been eagerly anticipating several books this quarter including, of course, Marry in Scandal (at the TOP of my list!). What books are you looking forward to reading? Anne: Thank you! I never remember when books by favorite authors are due to come out so I preorder them the minute I hear, and then they just arrive in my e-reader as a nice surprise. So I'm waiting for Mary Balogh's Someone to Trust, Julie Anne Long's First Time at Firelight Falls - - I love this contemporary series of hers - - and Eloisa James's Too Wilde to Wed. I also have a backlog of books to catch up on. And I love to reread old favorites - - it's like catching up with old friends. PJ: Thanks so much for visiting with us, Anne. Would you like to add anything else? Anne: It's been a pleasure, as always, PJ and Janga. Thanks so much for all you do for romance readers and writers. Have you discovered Anna Gracie's books yet? Do you have a favorite? Yes Ma'am. I fell in love with Anne Gracie books and have tried to get all that she has written. I am a person who loves a character driven story and her characters are so well drawn. Thanks for this review. Just what I need another book I MUST have. Thank you for those lovely comments, Annette.Much appreciated. PJ, if you'd told me you wanted a copy of Gallant Waif, my first book, I would have sent you one. I love her Chance sisters! Thanks, Natasha, yes I've been blessed with my covers lately. She's a wonderful writer, Patoct. Writes some of the best characters! Marry in Haste is my favorite. A good choice! I'm looking forward to George's book. I think she's going to be a pistol! Thanks, Cheryl, I was worried about that book as it took such a time for the romance to get started. But with some heroes, lead a hero to water but you can't make him fall in love. PJ, George's book is going to be the 4th book, and I think it's going to be quite a romp. The Perfect Rake!!! Love that series!! Me too, Linda. That was the first Anne Gracie book I read. Thanks, Linda -- that was my first book for Berkley, and still a reader favorite. I haven't as yet read her but her stories sound like something I would really enjoy. I have not read her. 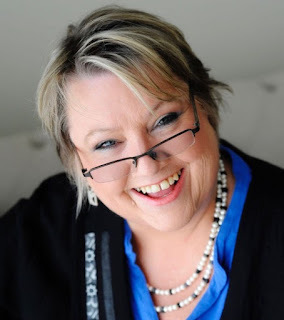 I am a fan of Anne Gracie's books and my favorite is The Accidental Wedding. I love the humor in her romances. I loved that entire series. I’ve been hooked on Anne Gracie since reading Talies Night almost 20 years ago. The perfect rake is one of my favorites. I really like the “marry in ....” series and keep checking for the release date of the next. PS. I already have Marry in Scandal so please don’t include me in that giveaway. Loved it! Thank so much, Betsy -- Marry In Secret comes out July 2nd. Oh Anne, I am so thrilled you are dedicating your new book to Janga. I really do miss her. I also want to add that I have read all of your books and get each new book as it comes out. In other words, you're the best! A must read. Eliza, I miss Janga so much, too. She wrote to me when my very first book came out, and we kept up a correspondence from then on, right up to the end. I was grateful to be able to say goodbye to her. It was a pleasure and a privilege to know her. Thank you for your very kind words about my books. I'm looking forward to reading Marry In Secret. I've only read a couple of her books but see I'm missing out. Have to get reading. Thanks, Carol. Hope you enjoy them. I have read a couple, but no absolute favourite. I must read more. sorry to say have not had the pleasure yet. I haven't read her book but they sound great. Kelly, I'm happy if anyone reads my books, but there are soooo many books out there, we can't possibly read everyone. My favorite novel is The Winter Bride. Annie's novels are memorable. The Summer Bride is lovely and captivating. I look forward to reading more of these wonderful stories. Thanks Traveler — I loved Daisy and I so wanted her to get her happy ending -- even if it wasn't the most conventional one. I see I’m missing something! I’ve not yet read any of her books. I’ll have to remedy that. Thanks for the post and giveaway. I hope if you do try one of my books you enjoy it, LSUReader. I think you may have introduced Anne Gracie to me & I've enjoyed several of her books since then. Di, PJ and Janga have been wonderfully supportive of my books. No, I haven't read her books! I love finding new authors though. I'm familiar with a few.